The Messe Wien is by far the biggest and the most important convention centre in Austria. It hosts the biggest conventions of Austria - however, referring to an article published in "Die Presse" - even these conventions are "...far from being big by international standards". There are exceptions to this rule, though: I first made it to the Messe Wien in 2007 when I worked as a science editor for the National Broadcast ORF and a convention of the European Society of Cardiology was held there - with almost 30,000 visitors. During this convention, all hotels of Vienna were solidly booked, high-end restaurants rejoiced thanks to strongly increased numbers of guests and brothels reported a significant increase in revenue (I called some for the TV report I did). As such indicators suggest, the Messe Wien is important for the economy of Vienna. The PR officer of the Messe Wien gave me directions on the phone, said that I have to walk down the main corridor - and advised me to come 15 minutes early. It turned out that the main corridor was - an estimate of mine - a kilometre long. The total area of the Messe Wien occupies 15 hectares, in-door exhibition space is 70,000 square metres. The most striking feature of the Messe Wien is a 26 metre high office tower with a peculiar, pointy steel-construction on top, adding up to a total of 96 metres. This tower refers to the Rotunde building (see below). Since 2008, the Messe Wien is well-connected to the Vienna subway network; there are also trams and an own taxi terminal. Some more facts and figures on Messe Wien: Each year, there are approximately 20 conventions being held in the Messe Wien. The convention centre was formally called "Messezentrum" and situated in the Hofstallungen, today′s Museumsquartier (more on this in the respective article). Today′s Messe Wien was built only between 2001 and 2004, after it had moved out from the former Imperial Stables. It is situated in the 2nd District of Leopoldstadt, on the border to the forests and parks of the Prater. There are four exhibition halls that can take up anything up to 25,000 people. More on the history of the Messe Wien: Conventions in the modern sense date back to the 19th century, in 1873 a Weltausstellung was held in the Prater. 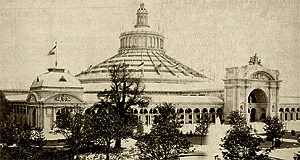 This exhibition was modelled after the Great Exhibition of Great Britain and held only a few minutes from today′s Messe Wien, around the central Rotunde-building. Following WWI, the Empire-gone-Republic of Austria tried to stimulate its battered economy by starting a convention company. Exhibition venues were dispersed all over the city, and the first conventions in Vienna opened their gates in 1921. The centre was the 1873 Rotunde. In the years following 1921, a bi-annual "Wiener Messe" trade fair was held in spring and autumn. In 1937, the Rotunde burnt down and with the Anschluss, Vienna lost its significance as a convention and fair centre. In 1942, the last Wiener Messe trade fair was held. In the course of the Battle of Vienna, the exhibition venue in the Prater suffered the same fate as most of the second district: It was shot to rubble, as it served as the last stronghold of the Wehrmacht fighting the advancing Soviet army. In 1946, the mostly destroyed area was used for a fair - as an opening convention for the re-construction of the venue. This was done until 1950, but other venues such as the previously mentioned Museumsquartier nee Messepalast or the Hofburg were more important for up-scale conventions. In 2001, the old 1950 buildings were demolished and the first section of the new Messe Wien was opened. A second extension was completed in 2004, the subway link - as mentioned above - in 2008. The area around the Messe Wien is a rather shabby one. There are private casinos and gambling venues, the tacky amusement fair of the Wurstelprater with the Ferris wheel, and some problems with drug traffic and illegal - often under-aged - prostitutes. Attractions nearby are limited. Note the Ernst-Happel-Stadion (sports stadium), the UNO City and the Donauinsel. The southern parts of the Prater are nicer, extensive green grounds and parks. As a residential area, the area north of the Messe Wien is considered cheap and unattractive; real attractions start only at the Karmeliterviertel. From there, getting to the First District is easy.